Heart and Sole: Oh, the Temptation! This is my taskmaster, and I am its slave. And this is my Rubicon. 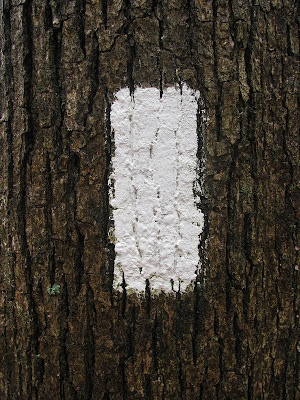 "Turn right," the white blaze commands. "Turn left," says my heart. This is the junction of the AT with the Virginia Creeper Trail. About four miles down either trail there is a short connecting trail between the two. The VA Creeper Trail is a rail trail that, in this section, follows the roaring Whitetop Laurel Creek, today (Sunday, Feb. 5th) roaring especially abundantly because of 24 hours of rain. On the other hand, this section of the AT ascends to Beartree Gap, crossing half a dozen small streams all also rain swollen and thus difficult to find dry footing, then the trail rides a roller coaster over three rocky knobs with no views but with the roar of Whitetop Laurel Creek constantly taunting me from 1000 feet below. Then the AT descends again, down a precariously steep slope on a trail with sixteen switchbacks built by the Civilian Conservation Corps. At the bottom-most switchback is an easy return access to the Virginia Creeper Trail. A sane person would not climb back up those 16 switchbacks, ascending 1000 feet again, only to burden himself with the traverse of three rocky knobs, each with 200 feet of climbing, and then slogging across half a dozen swollen mucky streams. Why put yourself through that twice after having experienced it once? Let the straight, smooth Virginia Creeper Trail take you back along the picturesque roaring stream on level graded trail. You get a whole new set of experiences - pristine scenery that you may never have the opportunity to return to ... and it's *so* much easier on your legs! "NO", insists the white blaze. "Sane or not, your mission is clear and uncompromising: pass every one of my cousins twice." 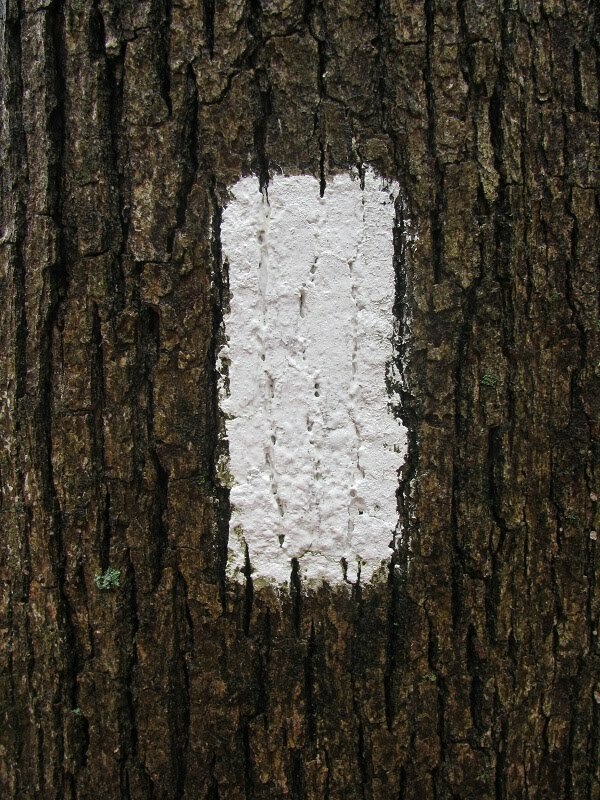 Every white blaze twice. Both ways. Period. Full stop. End of discussion. And so I obeyed my taskmaster. I knew that these temptations would come. There were more of them in the past two days - a veritable maze of delightful alternative trail opportunities in the Mt. Rogers vicinity. And doubtless there will be many more. Call me insane if you will. I won't deny that my single minded inflexible mission is a potential sign of some psychological condition or other. It probably takes that same insane streak just to attempt to hike 15 to 20 miles every day for eleven months straight. Comes with the territory. There was rain in the morning, but I happened to be passing by the Lost Mountain Shelter during the heaviest of it, so got to actually use a shelter for ... shelter ... for the first time ever. The rain let up after fifteen minutes and off I went again. At the end of the day I was contented. If I really want to, I can pull out my bike (which I have with me) and go do part of the VA Creeper Trail. Or I can come back to the magical Trail City of Damascus another time, perhaps during Rhododendron bloom time, and do the Creeper Trail in style. We'll see. Life is full of so many opportunities that cannot be taken. Endless temptation. Isn't it better that way?